This parcel of land at 42nd Street and Thomas Road has been in the Christenson family since 1941. It was part of a 5 acre plot and the site of my grandparents' house where my mother lived after attending Phoenix Union High School. For several years my grandfather operated an egg business on the property out of his garage. In 1960, my grandfather entered into a 60 year ground lease with Arizona Bank - which led to the construction of the Ralph Haver & Associates designed bank building. While high in style the bank was relatively short-lived. In 1986 the Arizona Bank was acquired by Security Pacific Corporation and subsequently by Bank of America and the local bank brand virtually disappeared. 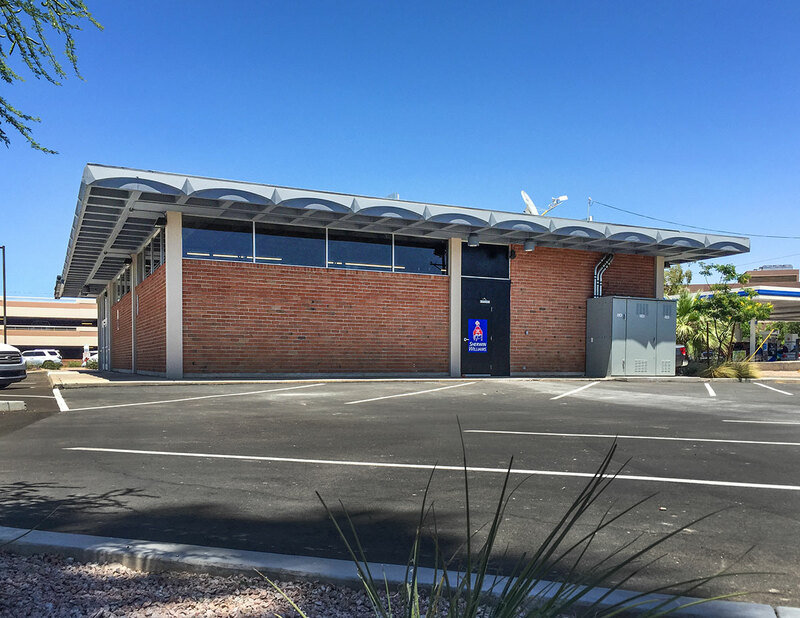 With a branch location already in existence at the corner of 44th and Thomas Rd., BofA made the decision to close the Arizona Bank branch location at 42nd Street and sublet the property to a Chinese restaurant. Drivers along Thomas Road might remember the restaurant's pink brick walls and teal concrete frieze. The Chinese restaurant operated for about 10 years before going out of business in 2005. With the Chinese restaurant closed, the building sat vacant for several years and aged considerably as a result of vandalism common to the Phoenix Metropoiltan Area during the economic downturn. In 2012, we made the decision to redevelop the property and bring it back to life. We entertained several offers in response to the simple “For Lease” sign we posted out front, and captured the attention of Modern Phoenix as a midcentury building that might be at risk. Most real estate brokers and developers that approached us were looking to bring a bulldozer and scrape the lot. We held firm to our conviction however, that the building should be preserved and adapted to its new use. 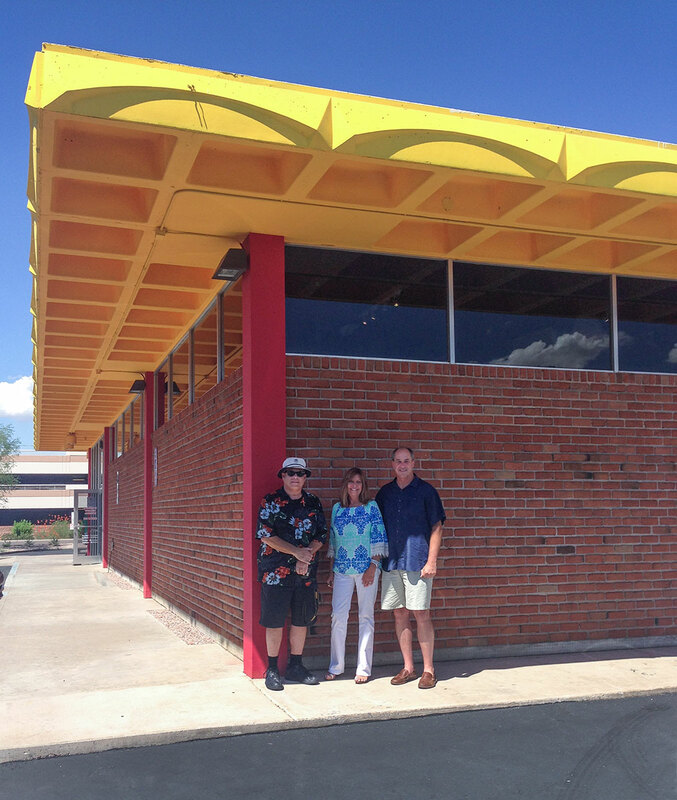 In 2013, we entered into a lease agreement with Fuzzy's Taco Shop. Their contractors helped us preserve the architecture and refurbish the property. Unfortunately, this arrangement was short-lived because Fuzzy's did not last. Several property improvements were made at this time and the prime location helped attract a longer-term tenant. Enter Sherwin-Williams. "The search for the right location and building in this area took several years. When I first identified this building (in 2013), it certainly had a 'vacant and used' appearance. However, the attraction was very obvious - a free-standing building with great visibility from East Thomas Road, easy access and a large parking lot," said Ray Starbuck, Sherwin-Williams Director of Real Estate. 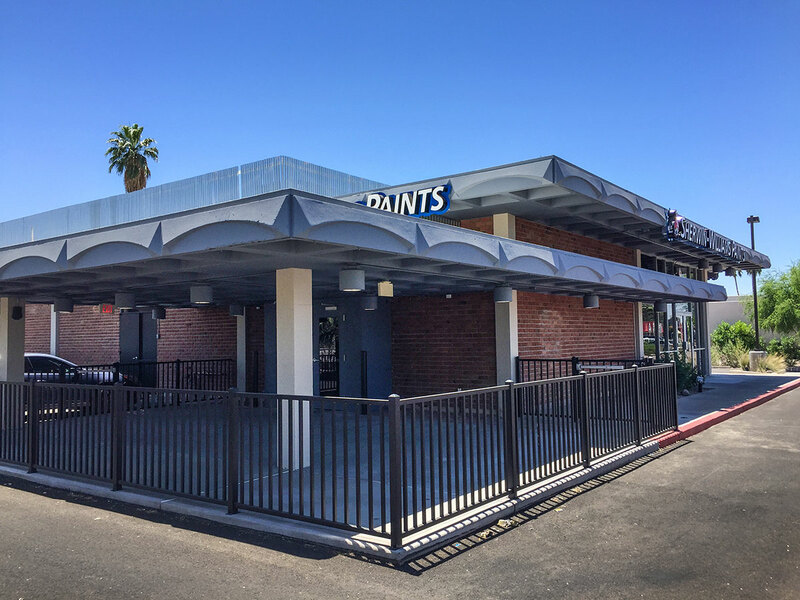 "The building’s appearance contrasted with the surrounding buildings and offered not only the basic elements needed for a Sherwin-Williams store, but also a unique opportunity to become a true icon and to again be a part of the community I knew it had once been." Unfortunately Fuzzy's beat them to the lease opportunity in 2013 and Sherwin Williams effort to develop a store in the Arcadia neighborhood had to wait. 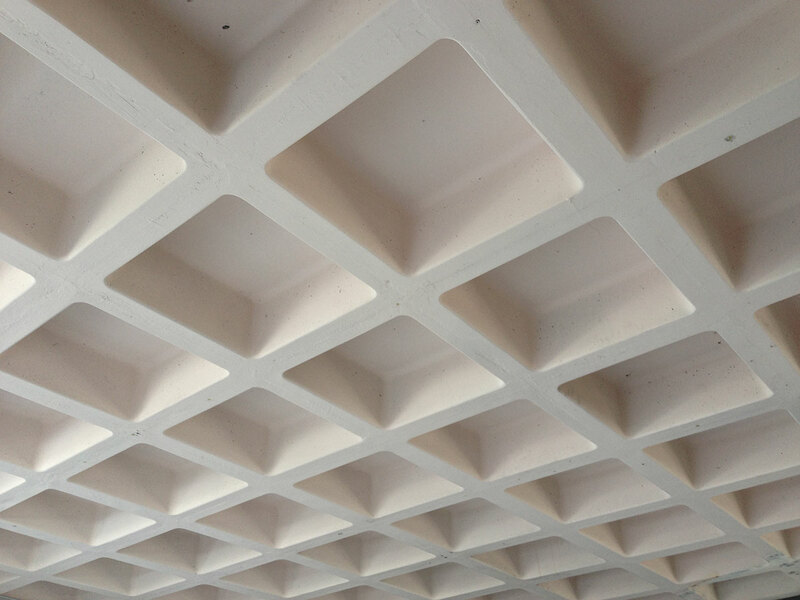 One of the most unusual architectural features kept intact during the refurbishment is the concrete waffle roof, which is slightly domed for tension, with hundreds of coffers that increase strength while reducing weight. One of the earliest standing examples of this type of construction is the Pantheon in Rome. Although Fuzzy's chose to paint this distinguished feature bright yellow and dark blue as part of their color scheme, Sherwin-Williams made a sensitive choice to return it to neutral white in 2016. Brian Crawford was the Project Engineer for Sherwin-Williams' renovation. "I studied what original photos were available to learn something of the design so that I could pay homage to the building and the surrounding community." Crawford thinks the project "offered an exciting opportunity for me to showcase a great building and Sherwin-Williams' commitment to the community. The building evoked many qualities of the modernist movement that I appreciate in the works of Richard Neutra and Mies Van der Rohe." He was attracted to the blending of interior to the exterior space, light, and material. The geometric frieze on the edge of the concrete eave is a nod to New Formalism, and is similar in spirit to the frieze Haver used on the Cine-Capri colonnade around the same time. 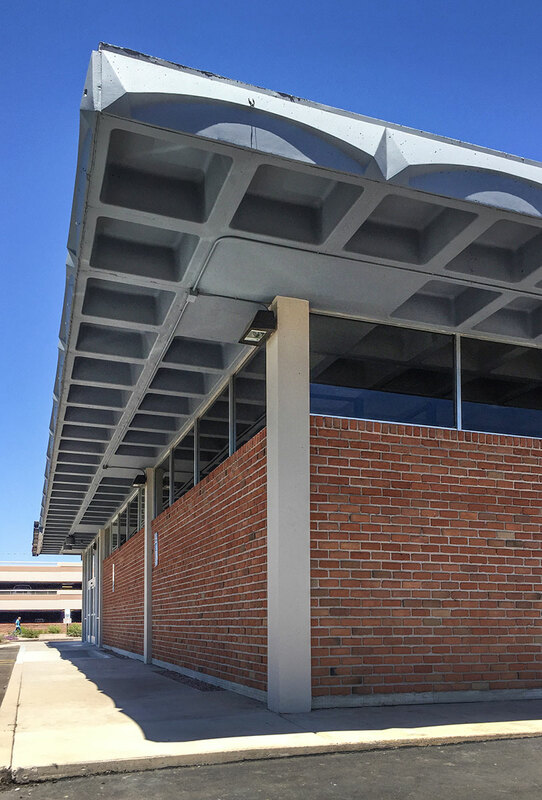 Knowing that the exterior color would make a statement for both the building and the brand, Crawford selected a blue-gray accent for the concrete that more closely resembled the original color and was consistent with the Sherwin-Williams branding. The strip of clerestory windows along the roofline lets indirect light into the new back room storage area while staying in the shade for most of the day. The drive-thru teller window was converted into an outdoor patio that benefits from evening shade on the cooler side of the building. Sherwin-Williams looks forward to entertaining friends and contractors in this outdoor space. Crawford had the interior brick exposed "to reestablish the dialogue between the interior spaces and the exterior environment." Paint performs best when contrasted with other textures and materials. The result is a warm and homey feel of authenticity clearly visible from the customer's point of view at the service desk. 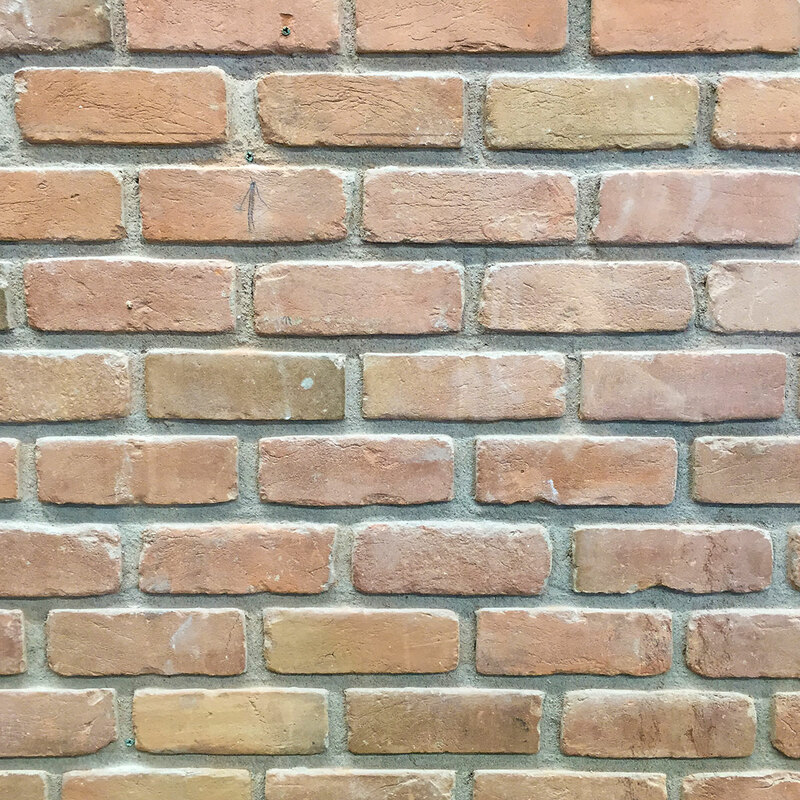 Based on a recommendation found on Modern Phoenix, Baja Sandblasting removed the pink paint off the exterior red brick in 2013. Many tenants had created openings in the exterior walls over the years, and so did Sherwin-Williams. 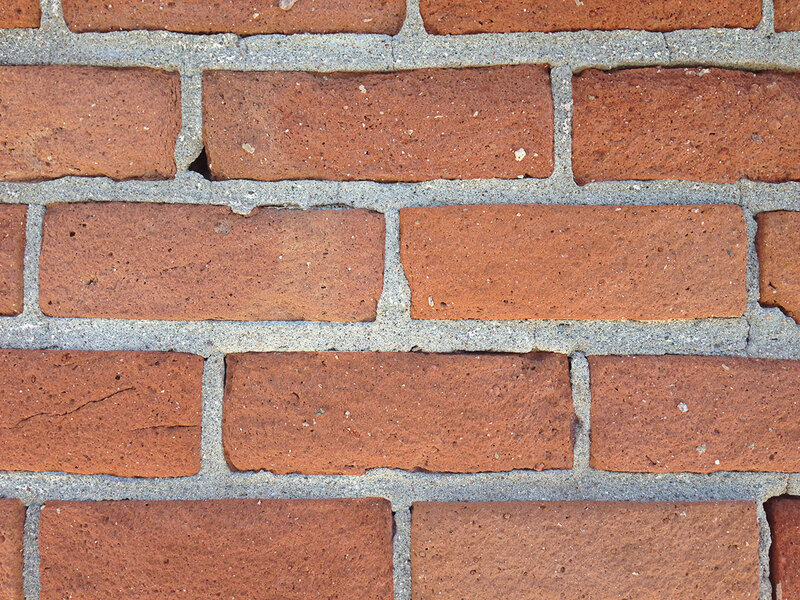 However, they salvaged the brick and repaired some exterior walls with it to restore the aesthetic. Here's a rare view of the continuous roof and vault before it was partitioned off again for Fuzzy's dining room and kitchen. 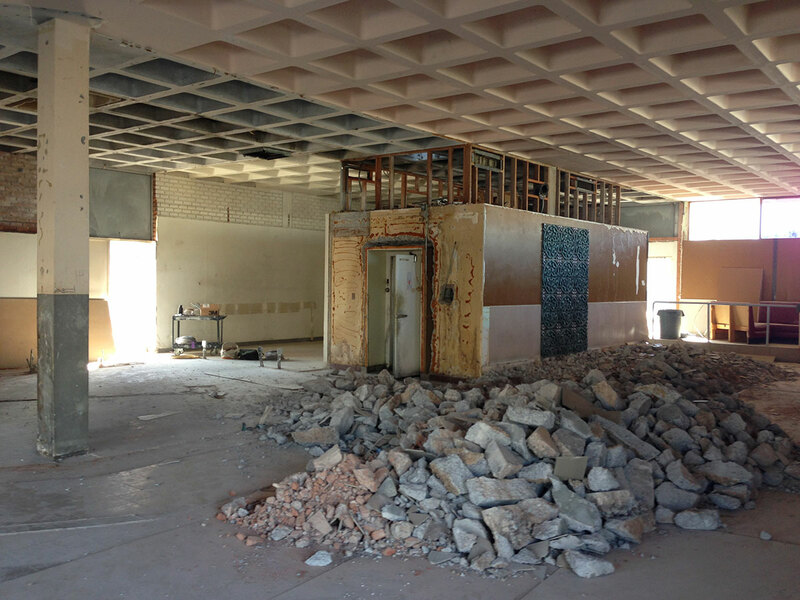 When Sherwin-Williams remodeled the space in 2016, the vault was removed. 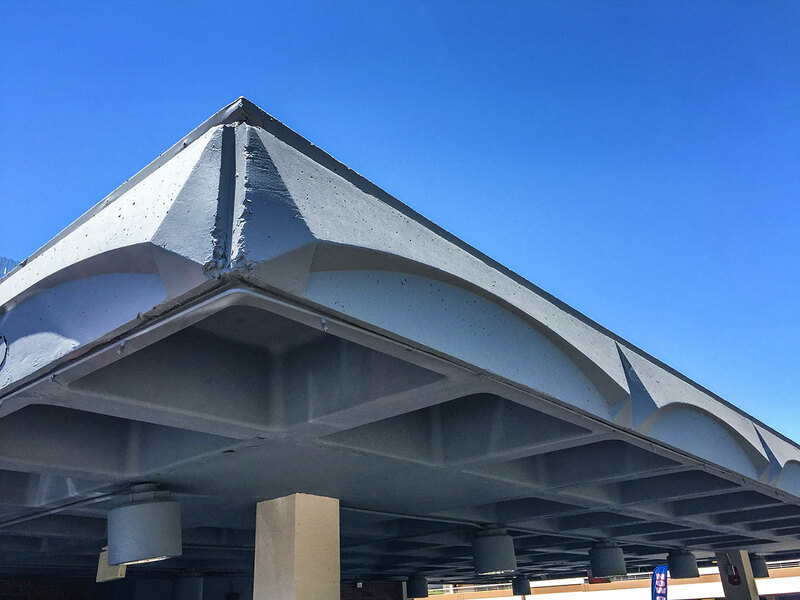 "During reconstruction our contractor discovered that the vault was structurally supporting the concrete roof," says Crawford. So they built a square column in its place, matching the other interior columns. Converting buildings "offers advantages to us, the building owner, and the building. By reusing buildings we use less energy and materials. 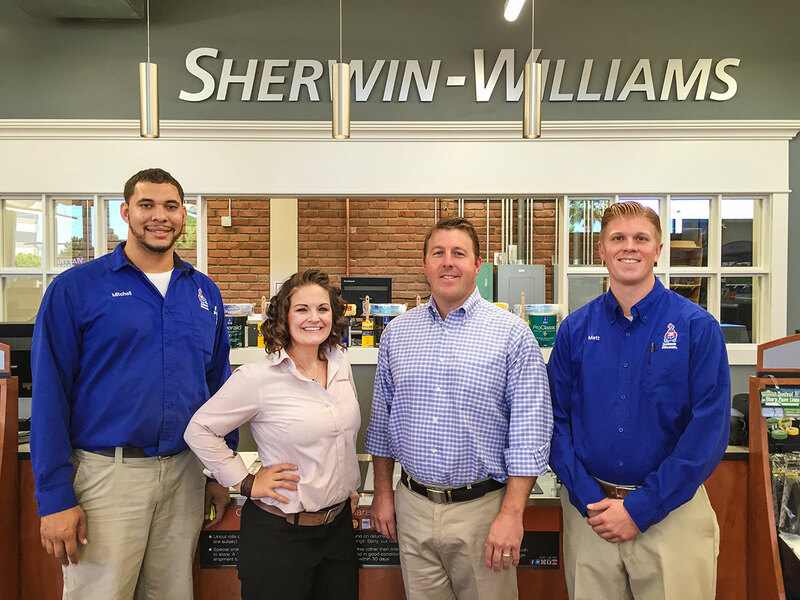 As part of the Sherwin-Williams reconstruction I implemented other energy-saving measures such as all LED lighting, programmed electronic lighting controls, and a centrally monitored A/C management system." The Christenson family is proud to have preserved one of Haver's firm's bank designs and look forward to having it around in the family for a long time. 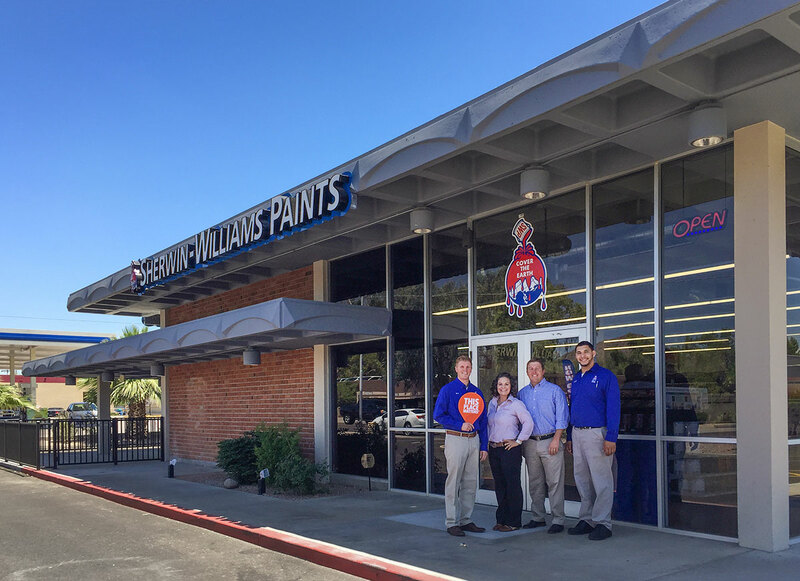 Sherwin-Williams is welcomed as a long-term tenant and we are grateful for their stabilization of this important part of Arizona's banking heritage.